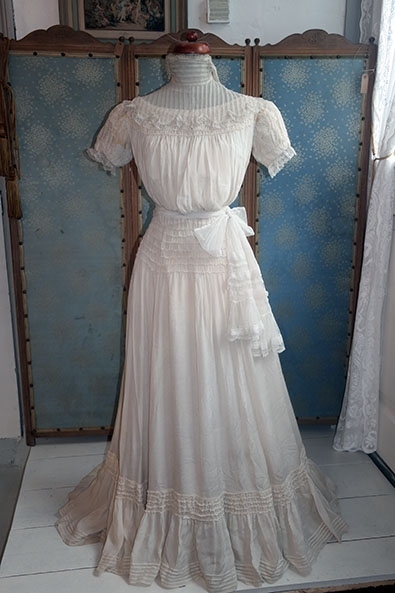 Lovely romantic antique late Victorian or early Edwardian gown, ca. 1900 - 1905. 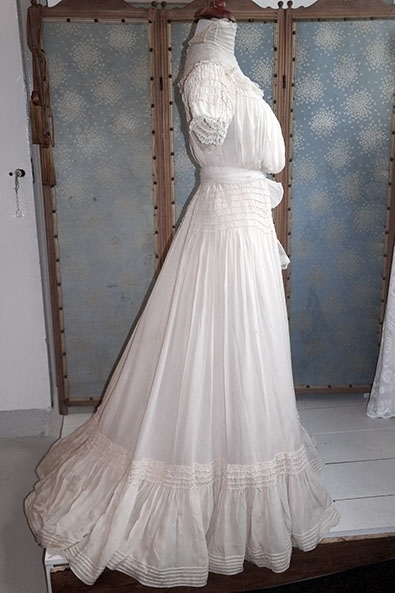 Beautiful lovely gown made of crepe de chine silk, which is a matte soft silk with a semi-transparent look. 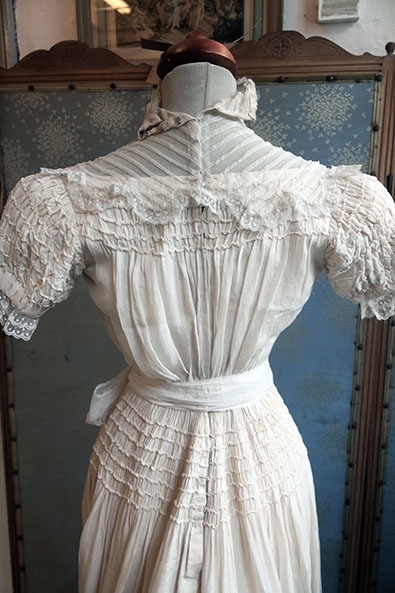 Seperate bodice and skirt. 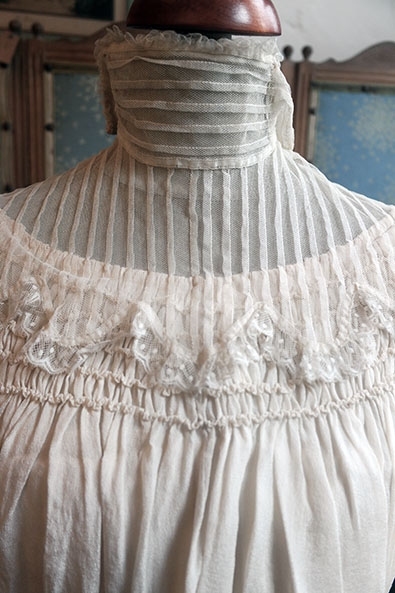 The bodice is draped at the front and had a pigeon chest model, the top part of the bodice is ruched with a tule and lace upper. 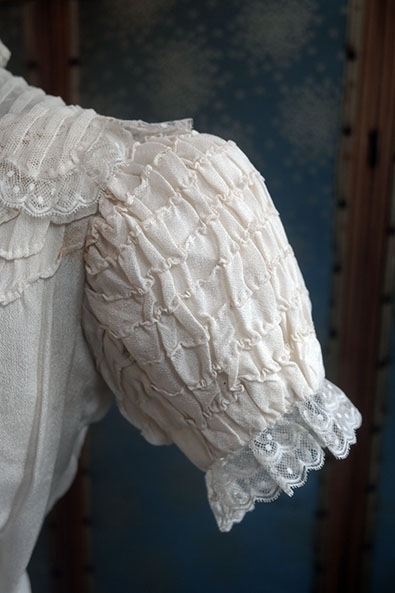 The lovely short puff sleeves are also ruched and trimmed with lace. 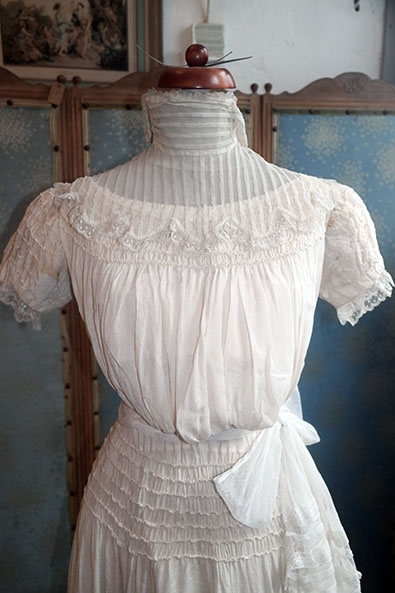 The skirt is ruched at the top and above the large ruffle at the bottom. The skirt has a small train. 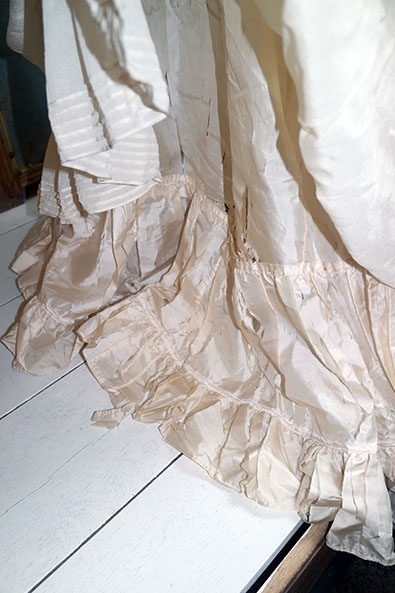 Under the upper skirt there is an attached smooth silk underskirt, also with a large ruffle. 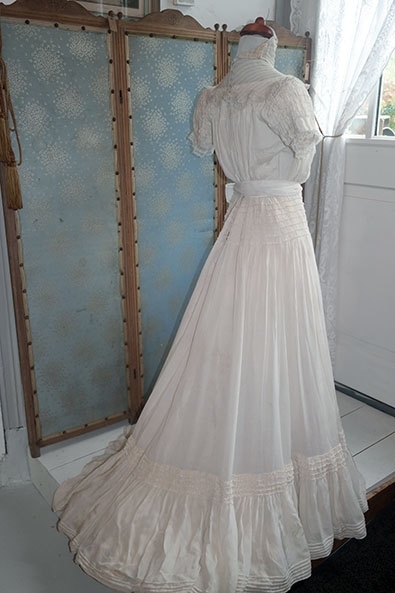 The gown is overal in good condition, especially the outer crepe silk parts. 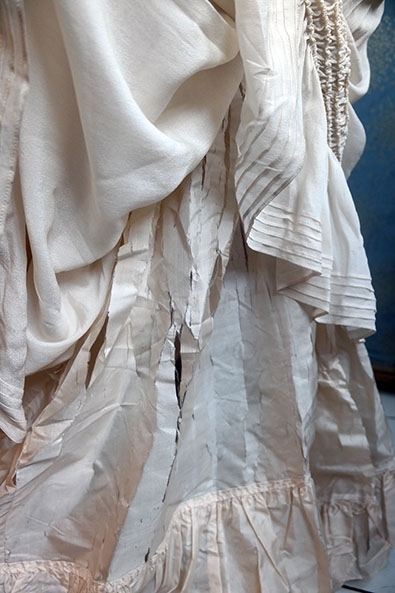 The attached underskirt however is in poor condition, with splits throughout. It is still attached however, it if handled carefull will remain so. It is not visible when displayed, but does add a lot of volume, so we've left it as it is. 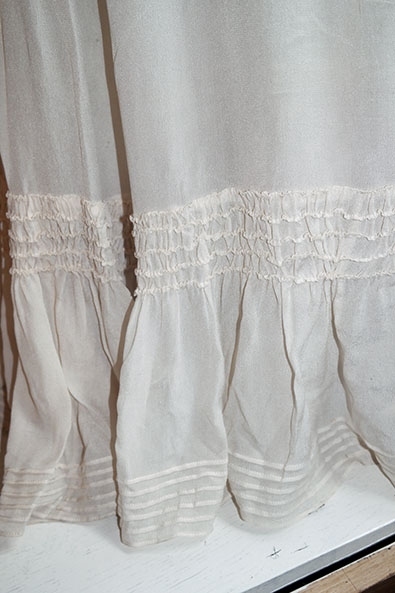 Other than the underskirt there are some worn spots at the underarms, though the silk is not very fragile there and they are not obvious. 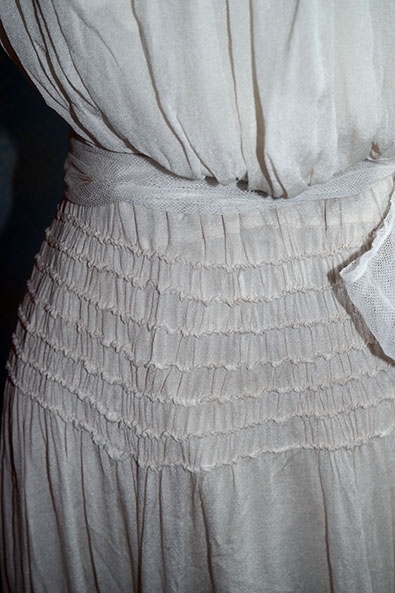 The skirt has a very small size. Bust approx. 83 cms (there is a bit more room there because of the shape), waist approx. 57 cms. 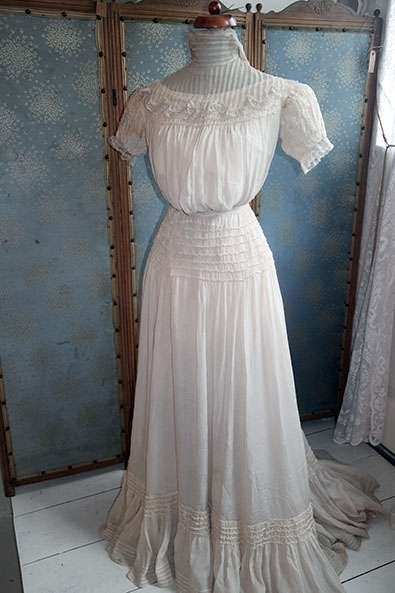 Made for a very petite woman or perhaps a teenage girl. 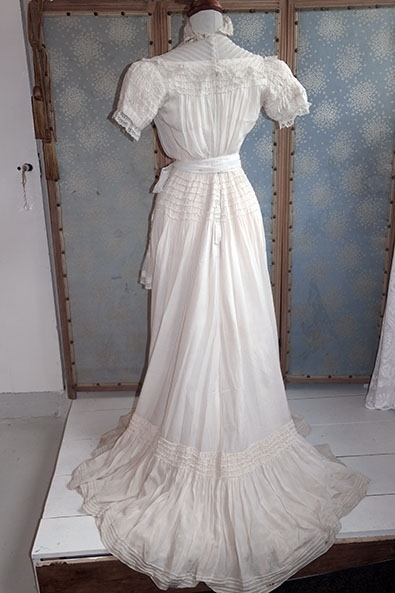 The sash around the waist is not included, the last picture shows what the gown looks like without it. The sash is available seperately.